Remember those warm summer evenings when it was still light out after dinner? Remember how we used to play outside for hours, slowly witnessing the sun dipping below the tree lines that bordered our streets? Perhaps I repeat myself on this subject, but the summer evenings, when it was too hot to be inside, certainly told a lot about what neighbors were, and how friendly life used to be. The memories of evenings like this are speical, and if I could, I'd be there right now. My mom always served us Neopolatin ice cream in a bowl as it was my Dad's favorite. We didn't always get ice cream, it was more or less a treat, but when she did, this was her ice cream of choice. You really couldn't go wrong with Neopolitan; it had all three of the best flavors in one! Since my Dad worked hard all day, she figured she'd serve his favorite ice cream. Neighbors would also be out, some on blankets, some on porches, and all would wave and shout a greeting of some kind. In a way, neighbors were a lot like family members. They could be counted on to do things when needed. Watermelon was a favorite for everybody, and wandering from house to house, you were sure to get your fill of it. My mom served canteloupe quite often, and I just loved it. Neighborhood games would get organized once the sun began to dip, and the sky turned the color of a creamsicle. "Tag" was always a favorite, but "Hide and Seek" was always the most heralded game. Life was safer then; kids could wander on their own a several blocks from the house and be perfectly safe. "Hide and Seek" was so popular because hiding places in the dark were so much easier to find. Many times you could move to different hiding spots if you sneak around quietly enough. The most fun was lunging out and scaring someone to death. If you could cause a coronary, you had a good game of hide and seek going. It was also fun to augment the game with a few monster stories just to make the dark hiding places less appealing. Of course us guys were "tough" and weren't afraid of *monsters, so it was fun to scare the girls. The most challenging aspect of the game was finding a place to hide that your friends, parents, or even the National Guard could not find you. I liked hiding in places like trees, the roof of the house, or under the car. 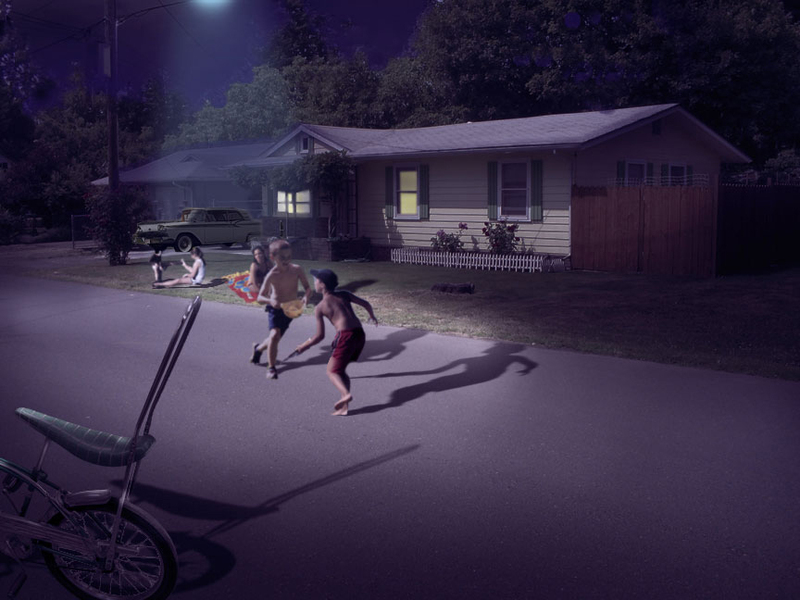 Besides being a game, Hide and Seek was pure adventure, and it was never more fun than it was on a hot summer evening. Amidst a cacaphony of kids yelling from the street corner, or black and white television shows blaring from sets indoors, or the simple joy of feeling a strong breeze as it fanned evergreens that bordered the perimeter of the neighborhood, The front porch was always a sanctuary. In the fall, or winter, you could get in out of the rain, and in summer, you could hang out, relax, and reflect. The front porch was always a great gathering place. I believe it was the same all over the country, no matter where a person is from. There were neighborhoods in Portland that had Brownstone type apartments with stoops instead of porches. I used to go over and play with kids on their stoops, and it brings back similar memories. Sleeping outside on blankets on a warm evening was about the best thing I can recall when it came to the bedtime ritual. Even though we agreed to be asleep by a certain time, my brothers and I, or friends, sat up talking for hours. There was so much conversation worthy of our time, and nobody to tell us to hush up and get to sleep. Out there in the great veldt of the backyard, in the fresh evening air with a chorus of crickets, near the clothesline and plum tree, life was as grand as it could ever be. First and foremost, watching for Flying Saucers was a must. When I was young,and sleeping out under the stars, the sky never looked bigger, blacker, and more mysterious. Above me was a giant velvet tapestry littered with stars. The unlimited possibilities of life beyond, or visitors from outer space cruising our galaxy was on our minds as we lay on our backs staring up at the heavenly mural without end. Monsters lurking in the bushes were another consideration. Fortunately, I had my brothers with me. Everyone knows that monsters cannot attack you when you have other guys with you. Yet, often, they would go back into the house to tease me, and see how long I could take it in the dark of night (which wasn't long). Everyone knows that in the dark of night, when everybody is sleeping is when the monsters come out. The worst monster I could come up with outdoors, in the dark of night, was The Wolfman. I knew The Wolfman was out there waiting for me. Finally, when I would fall asleep, I'd wake up in the wee hours of the morning to see the sunrise. The same orange sky that slowly descended to earth the night before, rose again to create a new day. Dew was everywhere, the blankets were damp, but still, it was so great! I'd go back to sleep knowing that everything was right again. There were no monsters outside; I'd survived my rite of manhood sleeping outside in the elements with the monsters, the UFO's, and the things that go bump in the night. Later in the morning it would get warmer. And as we all rose from sleep, gathering damp blankets that smelled of dew and cotton, we'd head back into the house for breakfast.